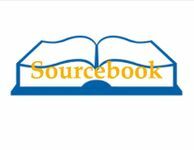 A sourcebook is a book which provides additional details for a game. For example, playing a particular type of character in a role-playing game, or a different magic system than the core rulebook. Or additional rules not found in the core book at all. Sometimes called a splatbook, the term splatbook comes from the idea of the * as a wildcard, so Clanbook: * meant any clan book. Asterisk is also known as a splat and the term splatbook was born. The term rose to prominence with the World of Darkness Clanbooks, but the product predates the term by many years.